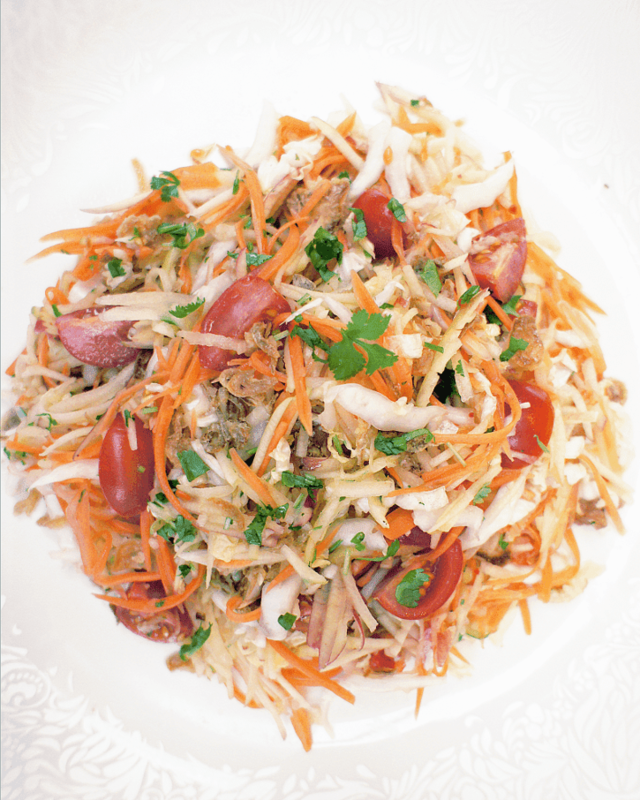 Apple, Carrot & Chinese Cabbage Salad with Vietnamese dressing | Grow Your Own Veg Blog. Gardening and Food Blog. To celebrate National Apple Day this month, this salad recipe uses British apples as it's central ingredient. I have chosen Jazz apples as they are tangy and crunchy. To balance out the sweetness, carrots and Chinese cabbage, a crisp mild tasting, pale leaved cabbage (also known as Wombok), are added to it. The dressing is inspired by the Vietnamese dipping sauce, Nước chấm, which combines the flavours of fish sauce, limes, vinegar and sugar with garlic and chilli. A crunchy topping of fried shallots, is thrown over the salad, just before serving. This salad can be served as an accompaniment to grilled squid or prawns. British Jazz Apples and Chinese Leaf Cabbage are available from Sainsbury's. To make the dressing, combine all the dressing ingredients in a small bowl and stir until the sugar dissolves. Shred the carrots and apples into thin strips, using either a julienne peeler or food processor. Combine the carrot, apple, chinese leaf, tomato, coriander in a bowl. Pour over the dressing and toss to combine. Top with the fried shallots. Ready made fried shallots can be bought from Chinese supermarkets. Thank you to Sainsbury's for sponsoring British Jazz apples this month.